The first ham radio operator at Ashwaubenon High School was Marc Winzenried, WN9ZCO (now WA9ZCO) he was licensed in 1968. He was an active member of the AV club and did the lights and sound for most if not all of the theater shows up until he graduated in 1970. He attended AHS the first year the school opened in 1966. The second ham radio operator was Mike Kassner, WN9BBD (now K0PBX), also graduating in 1970. The third ham radio operator was Jerry Thunes,WN9DLM (now WB9DLM), who was from the class of 1972. Marc and Mike started the AV club, and switched off being presidents of the club. The AV club was part of the library and Mr. Steven Frozena was the advisor. Mr. Gerry McCartney, a tech ed teacher, learned about a civil defense grant and submitted paperwork to acquire some ham radio equipment as he was aware the school had a couple of active hams. The Drakes along with the Hy-Gain HyTower HF antenna were acquired in 1969 when Marc, WN9ZCO was a senior. After 1972, Scott, KB9AMM, Ken, KB9LRG and possibly others attended with really no knowledge of the previous hams. After the spring of 1978, the Drake HF equipment went into storage. The Ashwaubenon Cable Club (TV studio- WAHS) began in 1982 at Ashwaubenon High School by Mr. Tom Yungwirth (physics teacher). It was a spin off of the library audio visual club that some of the AV student enthusiasts prompted. Two years prior a Radio Club formed as it's precurser. A construction permit for a school radio station was applied for, but was denied by the FCC in 1982. The Cable Club taped school athletic games that aired on Cablevison of Ashwaubenon Channel 4. Mark Bialik resurrected in-house TV channel 4 at AHS in 1984 and became vise-president of this club. It really didn't have any activity when he started as a freshman, but he worked with Mr. Jay Yungwirth and got it re-established, broadcasting music from the head-librarians office in her office at the rear of the library. A year or two later, they secured a room on the second floor of AHS. This is where Kevin Oleniczak & Mark taught a summer class from and first met Chris Lankford and Chad Stiles. The both took a summer school video production class just before they started their freshman year in 1989. Mark was also working as a radio DJ at various places so he primarily handled the audio end of things while Kevin handled video. 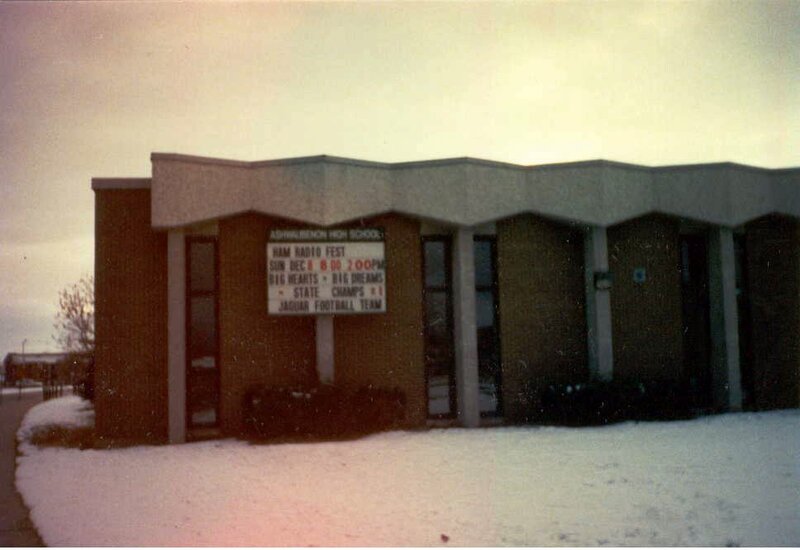 Some years earlier, in June 1979 the school board authorized Ashwaubenon's radio club to apply to the FCC to construct a radio station at the high school. At the time there where 15 members, and their task was to show the FCC how the station will serve the publics needs. The project never became on over the air station due to the complexity of the FCC paperwork. Corey, KB9BNA was an instrumental student at the high school just before the youth ham rush. He obtained his ham radio license in January 1989 and was an active member of the Ashwaubenon Cable Club. In just less than 3 years (just after no-code license became available) he sparked the interest in many others and brought a new influx of young hams. The first person he sparked was Kevin Oleniczak, who obtained the callsign, N9JPG in 1990. Chad, N9PAY obtained his license in April 1992, everybody thought he was nuts when he suggested putting up a repeater at the school and create yet another spin-off, but this time more of an actual formal ham club. Mr. Gerry McCartney Chad's tech ed teacher, talked to him about starting the club (along with Mr. Rudie, also tech ed) he showed Chad the Drakes which he said were purchased with a civil defense grant back in 1969 along with the Hy-Gain HyTower HF antenna. Kevin, N9JPG and Mark Bialik (not a ham) from WAHS helped Chad, N9PAY and Chris, N9PAW get things started. The AHSTC was set up a little differently than other ham radio club. It was actually more than just a ham radio club, yet the school viewed it as just the Tech Ed Club. The tech club involved more than one hobby or activity area. It actually meant to encompass four major areas; Manufacturing, Construction, Automotive, and Electronics Communications Technologies. What most people remember and seemed to focus on the was the Electronic/Communications area. Kids in this group could work on projects of their choice, working with the resources available in the electronics lab, drafting room, computer/graphic labs, and the ham radio shack. Some of these projects could be, building an electronic circuit, designing a room, working on a CAD program, or working distant stations on the ham radio shortwave bands. These resources are made available to the students, to apply what they have learned in classes, or on their own, to work on club projects, or a project of their choosing. Previously, if the student wanted to work in an area like this, he would come in after school and get help from the teacher. The Tech Ed Club expanded this by having students work together to accomplish a goal. The students could propose a project in a club meeting and then the students will attempt it, if it is passed by the group. The procedure was addressed in the club Bylaws. Another unique thing about the club, was that the school allowed a "users group." This group was made up of other students from other local schools, and it also included other instrumental and sometimes older-elmering members. All members, AHS students and abroad met together at the high school, and had the same voting, membership, and repeater access privileges and would work on projects together. Since Corey is accredited with bringing the youth influx to the high school and happens to be a technically minded individual who just happens to have Red hair. The term "Red" was created as a complement/tribute. This is explained in the AHS dictionary. There are many offhand "Red" references such as the 2.2 K resistor. As most of our members have been younger in age, it's fairly noticeable that it seems there is a whole different language used by these people and on the repeater. The Green Bay Area Youth Net was held Thursdays at 6:30pm on the repeater. Club meetings where the last Wednesday every month at 7pm. "Get your HT's and mobile on to the AHSTC meeting tonight at 7pm" Popular after meeting gathering places where Country Kitchen on Oneida or the 41 South truck stop in De Pere. The annual October meeting was a Halloween dress up meeting, and the December Christmas party meeting was held at Old Country Buffet. March 1993 N9PAY, N9PAV and N9PAW worked the WI QSO Party and classified as the category of Multi Multi Tech and the score of just 330 will live in infamy as this category was retired in 2001. October 1993 Chad, N9PAY and Chris, N9PAW where excused from class all day to dig the tower base at the high school and shortly there after the concrete base was poured. Their enthusiasm drove them to try putting the tower up by themselves, but that didn't work out so well. They got it up between 45 and 60 degrees before they got the giggles and couldn't stop laughing. This of course, made them loose their strength, and the whole tower fell to the ground, and the repeater antenna was damaged from whipping the ground. March 1994 Upon repair of the dual band Diamond, and on a nicer day, Scott, KB9AMM helped pull the 60 foot tower up with a rope and his van. Jason, N9PAV had fun with the concrete drill to make the hard line entry point into the building. When it was up and running, they placed a red scarf at the top, just under the antenna to celebrate the event. Earl the dead cat (club mascot) was also hung from the tower for a short period of time. April 1994 Marked the completion of the shack. The shack was probably a little smaller than 10x15 and was in the back of Room 140 of the high school. It was constructed to house the repeater and radio equipment, mainly as project by Paul Zochert. He was not a ham, but a friend of Chad's. (Since the tech club was meant to consist of more than one trade in the tech ed realm). It was built with wooden studs and drywall, a plexiglas window, and locking door. We had backup power installed from the school's generator, and a phone line installed for autopatch and remote repeater control. By this point, the repeater was complete and installed at the high school as most remember it. April 1995 The first AHS hamfest. This was held in the schools gymnasium. It was held in conjunction with Brown County ARES. March 1996 Several club members travel to provide communications assistance for the Weyauwega train wreck. December 1996 The last AHS hamfest, also held in the gym..
May 1997 Several members provided volunteer radio communications utilizing the repeater for the 114 Annual Ashwaubenon Parade that went down Onedia St. Memebers met at the Ashwaubenon Public Safety center for a briefing by Randy, N9GDW who works there. September 1997 Club president, Chad steps down and moves to Milwaukee to attend school. May 1998 Changed the callsign on the repeater, previously that of Chris, N9PAW now club call N9DKH. "The Paw" fit well while at the high school, as this was the mascot for the Ashwaubenon Jaguars. N9DKH was the former call of Jake D., now W9BLI who likes to "mobo on"! We all like to mobo on too, and we all got a kick of how he said his call with his famous golden Belgian voice, so we grabbed it once it became available. We made a lot of people scratch their heads wondering why Jakes old call is now on the repeater, since we didn't tell anyone. July 1998 Trustee and club advisor, Ken Rudie, N9ZRU announces his intent to retire within the next year, and announces the tower will need to be moved due to an upcoming addition to the high school. The future at the high school seemed bleak with dwindling student involvement. We voted to moved the repeater from AHS, to Tower Electronics. The new antenna was Hustler G-7. 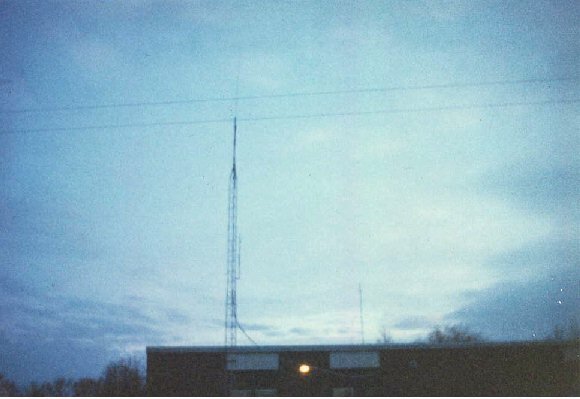 May 1999 We sold the Drake HF club station from the high school days and bought the Green Bay Mike & Key Club's Kenwood TS-440 HF station as they recently upgraded their station. The beauty of the TS-440 is that it can work in conjunction with the CAT-1000 controller as a HF remote base using the Doug Hall interface mode. October 1999 We experimented utilizing consumer off the shelf wireless Ethernet devices, at much greater distances. Accomplished via high-gain outdoor antennas, and possible amplifiers. January 2001 Hustler G-7 antenna failure, top section let loose, repeater relocated to Scott, KB9AMM's residence, utilizing a Comet GP-9 antenna. September 2002 We completed designing & building an electronic hands-on interactive "firehouse" puzzle of sorts for the Neville Public Museum. The firehouses or puzzle pieces are placed on the boards squares that light up when placed in the right places. At the beginning of the year Bonnie Berken from St. Norbert's College sought our expertise in electronics as she was named the guest curator for the upcoming Museum exhibit titled: "Culture Counts: People, Patterns and Pi." The exhibit ran from 9/02 to 1/04. June 2004 We began evaluation of Icom's 1.2 GHz ID-1 D-Star solution for ham radio voice and data communications. September 2004 Assist in the construction of the 444.225 MHz, Gillett (Krispy Kreme) repeater. PAVALN electronics designs a PIC identifier. June 2005 Installation of a 900 MHz to 440 MHz cross-band atop the 10 story high St. Joseph's Hospital in Milwaukee. This is to support a VOIP link back to the 075 repeater. September 2005 Repeater relocated to Steve, KB9MWR's residence, utilizing another Hustler G7-144. This move was to improve hand-held coverage in town and to more easily support work on further repeater updates, along with support for EchoIRLP connectivity. Members finished decoding and submitting two-tone paging data for all Brown County EMS and Fire departments as well as frequency data to the radioreference database. April 2007 Assist in the rebuild of the Green Bay Mike & Key Club's 444.775 MHz repeater and IRLP installation. October 2007 Replaced the Milwaukee cross band- VOIP link. Deployed a Quantro repeater on 443.325 MHz (PL 127.3), and an experimental Quantar on 927.5125 / 902.5125 MHz, DPL 223. October 2008 We experimented with the 1 Watt 900 MHz AeroComm ConnexLink data modem and 2.4 GHz Ubiquiti Nanostation. An AeroComm report was submitted to the HSMM working group and printed in the Fall 2008 CQ-VHF issue. March 2009 An Ashwaubenon Tech Club Facebook page is created to help track down old members and for general discussion, as well as projects. A joint purchase is made with TEARUG on an IFR service monitor. July 2009 Assist in the rebuild of the Green Bay Mike & Key Club's 147.360 MHz repeater. Steve makes mention in Steve Ford's (WB8IMY) Eclectic Technology Column in QST June 2009 titled "High Speed Multimedia at 3.5 GHz"
December 2009 Both Green Bay and Milwaukee 900 MHz repeaters now coordinated by WAR using the new 25 MHz split band plan that we recommended to WAR and made meeting a show of support for... 927.5125/902.5125 DPL 223 on both systems. April 2010 An experimental homebrew D-Star repeater is constructed and put on the air for testing in Green Bay. December 2010 Marked the final completion and edification of a two year long project to archive and index 73 Magazine. July 2011 Assist in the installation of Green Bay's first official D-Star Repeater, obtained by the Green Bay Mike & Key Club though an Icom promotional offer. 444.20625 + 5.0 MHz. The regular Saturday morning Perkins (Julie's prior) with our elmer (LJ/ANSAR) end. November 2011 Members construct Deviation Meters. This also marks completion of another couple long magazine archiving projects. One is Radio Electronics. The club obtained some 70cm 802.11 cards for testing, which will commence come spring. April 2012 This year we lent assistance to the formal formation of WI9NCR, an organization mostly of assisting in tower climbing. Earlier in the year we upgraded the EchoIRLP computer to support voice recognition. July 2013 Bob & Steve assist in the construction of the WLWB tower. December 2013 A homebrew P25 repeater was constructed and put on the air on Scray's hill. It consists of modified W9 Astro Spectra radios and a Asterisk App_rpt controller. April 2014 Club station upgraded to a Kenwood TS-2000. November 2014 An extensive project to digitize and research the areas ham radio history begins as the Green Bay Mike & Key club turns 75. November 2015 A DMR repeater (442.83125 +5 CC6) replaces the homebrew P25 repeater. January 2016 IRLP replaced by Allstar, node 43193 to support multiple VOIP connections. January 2017 The call book digitization project that spun off from the history project concludes. Paper call book records from ~1909-1997 are now online for the benefit of all. August 2018 Assist in the replacement of the Green Bay Mike & Key Club's 147.120 feedline and antenna. Over the years since disaffiliation with the high school our paper work has fallen by the wayside and some has been misplaced. In stages we have managed to update it over the last few years. Jason, N9PAV has replaced Ken, N9ZRU as trustee, and we have officially dropped the "high school" part of our club name, as none of us are in high school anymore. We decided the shortened version, the "Ashwaubenon Tech Club" still fits, as Ashwaubenon is where we were founded. It maintains a certain level of heritage that would not exist if the club name where radically changed. We now exist in a slightly different form, as we no longer act like a regular formal radio club or organization. We are mainly now a fun organization, a purely social club and working group. Over the years our distinction has been a younger group of members and a more relaxed youth type of on the air atmosphere. We still welcome and encourage younger hams, along with our continuation to encourage members to personally (or as a group) investigate any kind of technology that just seems cool or interesting. We accomplish this on the air primarily through the repeater system that we maintain. These revised purposes and scopes are derived from our original bylaws, Article 2: Purpose and Scope that stated; "AHSTC will provide...an opportunity to be part of a group of peers that have a similar interest..." and "The AHSTC will provide an environment for advancement of technology." Everyone who was ever a member is now considered a life member. There are no longer any dues. Anyone is welcome to join and attend periodic informal meetings, work on projects together, and just enjoy the fun. We engage in many hands-on/homebrew projects as most members went on to college for electronics and or microcomputers.